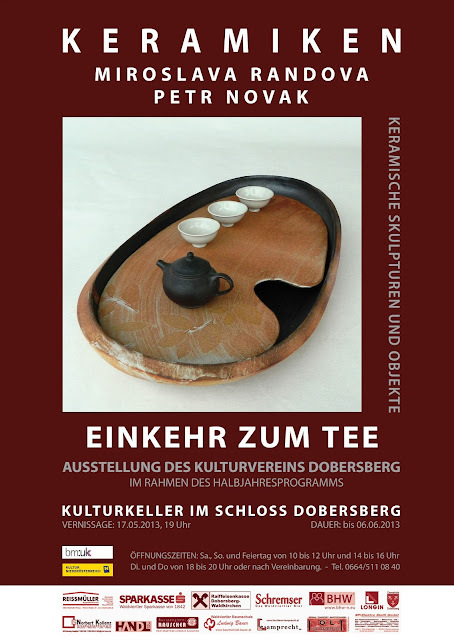 Few months back, we were asked to prepare an exhibition for nice gallery which is part of castle in Dobersberg. The theme is, as you can foreseen, tea settings as art for five sences. I don't know how many of my readers will be around, but you are all more then welcome to be present during the opening. There will be expressive music of Jana Vébrová, profesionaly and with love prepared tea by our friend Tomáš Rajnoch and, of course, some gems from our kilns. Tea ware to see and touch, kettles and water to sing, tea to taste and scent. We will be happy to meet you. Opennig is this Friday, 17th of May at 7 p.m.. The exhibition will there till 6th of June. For all who can not come to see it live, we will take some picutres of share. After openning update: You can pictures from the exhibition in this album. Pictures were taken by Michal Zajaček, who visit the openning with his camera and profesional, photographer's eye. I wish I had time to give you a visit but I'm busy with my final exams until end of June. Wish you good time over there. How about a german beer?